Meatballs al forno are the A-listers of the meatball set. They’re on the menu at Nancy Silverton’s Mozza restaurant in Los Angeles and they’ve got the reputation for being the best meatballs in the world. Take a bite, I think you’ll agree. VINTAGE VIEW ~ these amazing meatballs al forno are from TVFGI archives. As part of a new series on the blog I’m reviving some of the best recipes that you may have missed over the years ~ I’ve updated the recipe and notes, and shot new photos. First published in 2011 (the very first year I started blogging,) this recipe has been a family staple ever since, I think you’re going to love it! 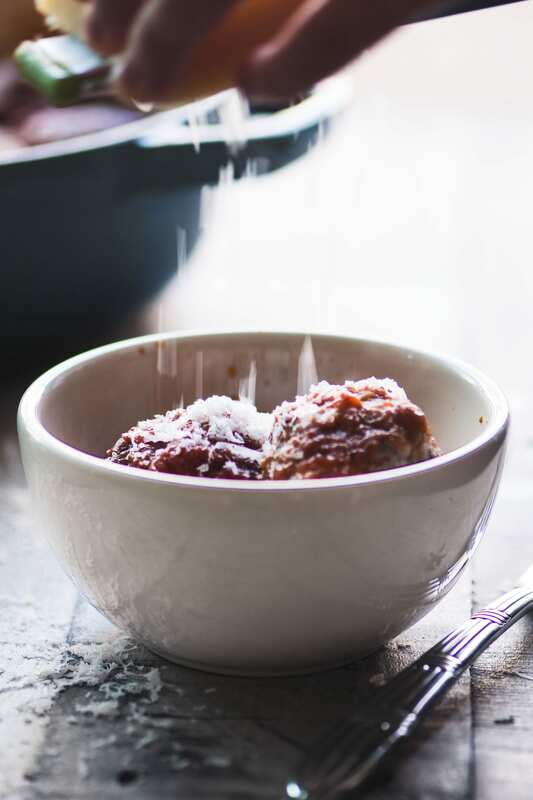 This amazing meatball recipe comes from Nancy Silverton, Cordon Bleu educated chef, cookbook author, restaurateur, and co-founder of the Los Angeles based La Brea Bakery. I’ve lived here in Los Angeles for 25 years and I can tell you that when Nancy Silverton opened the La Brea Bakery with her husband in 1989 she brought artisan quality breads to a city bereft of a ‘bread culture’. I’m talking pre-fab white bread on the tables of fine restaurants, and bakeries filled with doughnuts, cupcakes, cookies…everything but real honest bread. For all of our years in LA we relied on the La Brea breads for everything from baguettes to croissants. It’s no surprise to me that the brand soon went nationwide. In later years Silverton went on to open several restaurants, including the hip Melrose Avenue Osteria Mozza and Pizzaria Mozza with partners Mario Batali and Joe Bastianich, and author many cookbooks. Today I’m making the fabulous Meatballs al forno, a signature dish at Osteria Mozza. The recipe also appears in her 8th cookbook, THE MOZZA COOKBOOK.. At the restaurant the meatballs are served Italian style, in a little bowl with sauce, not piled on top of a mountain of spaghetti like Americans eat them. I’ve come to love them this way best, and they make a wonderful lower carb light meal. The original recipe calls for veal, which I don’t eat, so I substituted good quality Angus ground beef. The pancetta adds a nice flavor so I don’t recommend omitting it, although the very first time I made these I sent my husband out for the meat, and the butcher misunderstood and gave him prosciutto instead of pancetta. That worked too! I think the combination of different meats, the milk soaked bread, and all that good Parm is key to why these meatballs are so good. This is a dish that takes some time. 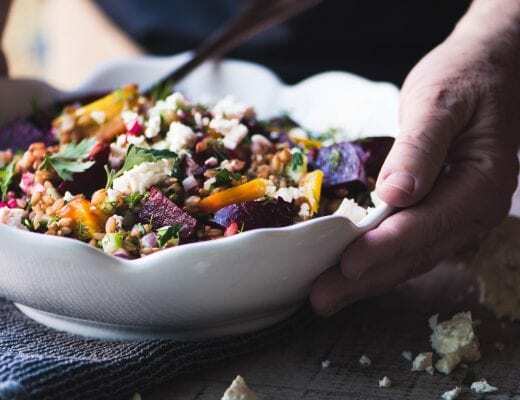 There is a fair amount of prep and I recommend you do it ahead, and maybe even go so far as to use those little prep dishes for your ingredients since for much of this process you will be up to your elbows in raw meat. In other words, don’t plan on chatting on the phone while you put together these babies. 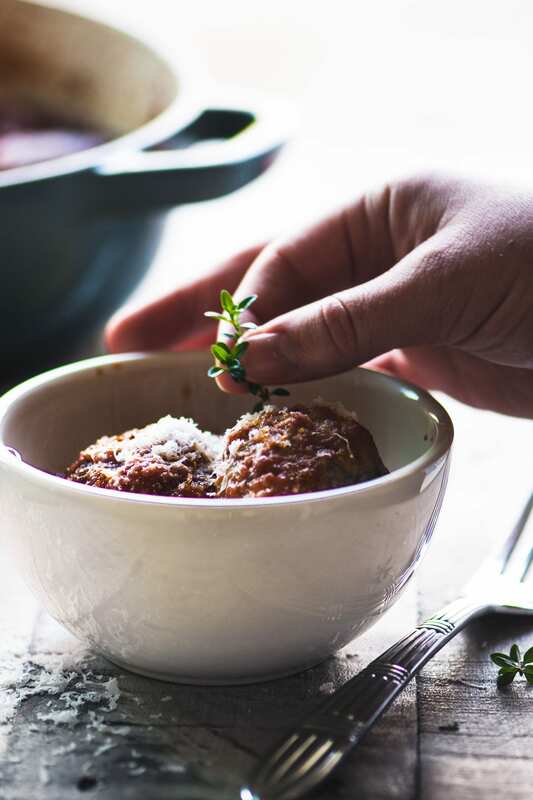 TIP: When mixing the meat, Silverton advises you to “use the tips of your fingers as if you were playing the piano” to avoid tough meatballs. I find that using my KitchenAid stand mixer makes the best tool for mixing meatballs and meatloaves. It combines everything more thoroughly than I can do with my hands, but still gently so that the results are super tender. I had high hopes for these meatballs because of their reputation, and I wasn’t disappointed. They are light and almost airy…with subtle flavor. I really liked them with the simple clean tomato sauce. I ‘m making meatball sandwiches on good crusty Italian bread with the leftovers tomorrow. Below is the slightly adjusted recipe for Meatballs al forno, with my slightly simplified instructions. If you’d like more of Nancy’s recipes, check out her book, The Mozza Cookbook, or any of her other cookbooks. Put the day- old bread in a small bowl, pour in the milk, and set aside to soak the bread for about 5 minutes. Combine the Parmigiano-Reggiano, onion, parsley, eggs, garlic, ground red pepper flakes, salt, and pepper in a large bowl and stir to thoroughly combine. Add the pork, veal (or beef), and pancetta. Divide the meat into 2-ounce (give or take) portions and roll each portion into a ball. I use a 1/4 cup to scoop the meat mixture. Pour the olive oil into a large Dutch oven or ovenproof skillet and add more if needed to cover the bottom of the pan to 1?4 inch deep. Heat the oil over medium-high heat until it is almost smoking and slides easily in the pan, 2 to 3 minutes. Working in two batches, place the meatballs in a single layer in the pan and sear them until they are lightly browned all over, being gentle when turning them so they don't fall apart. Remove the meatballs to a plate. Add more oil to the pan and heat it until it's almost smoking before cooking the second batch in the same way. Turn off the heat and wipe the oil and browned bits from the pan. Return the meatballs to the pan. Pour the tomato sauce over the meatballs. The amount of sauce you need will vary depending on the size of the vessel you are pouring it into, so add more or less as needed; you want them to be submerged but not drowning in the liquid. Add the bay leaves and and place the meatballs in the oven to braise for 1 hour. Remove the meatballs from the oven and allow them to rest in the sauce for at least 10 minutes. 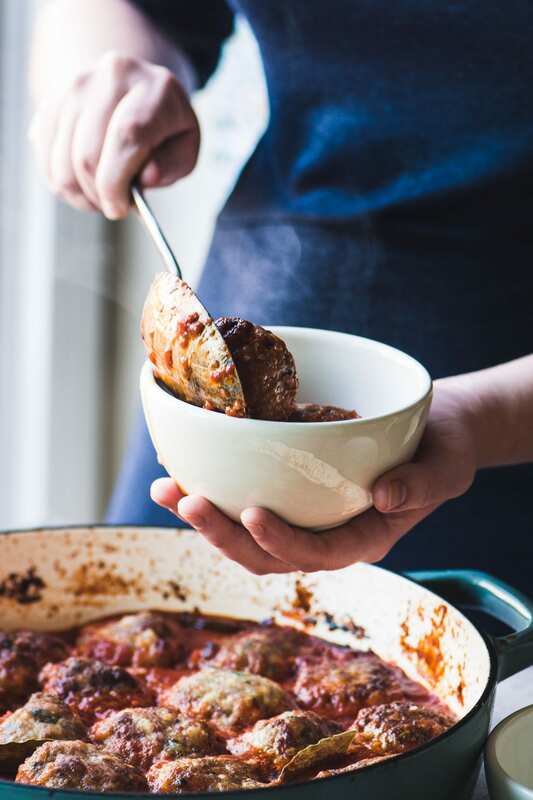 To serve, remove the meatballs to a plate and skim off and discard the fat from the sauce. 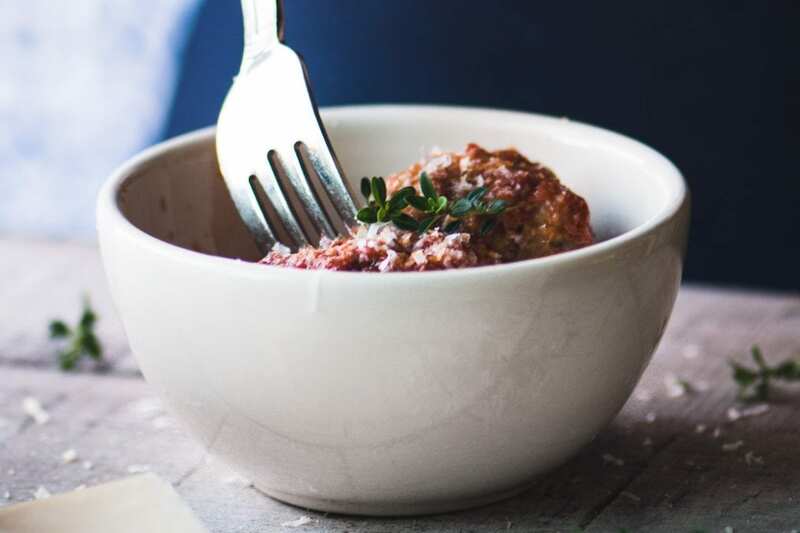 Spoon a thin layer of sauce on a serving platter or individual plates, lay the meatballs on top of the sauce, serving 3 meatballs if you are using individual plates. Grate a thin dusting of Parmigiano-Reggiano over the meatballs. Garnish with fresh thyme or more parsley. The original recipe includes a quart of chicken stock mixed with the tomato sauce, and then poured over the meatballs. I almost always omit the stock, fyi, because I like a thicker sauce. 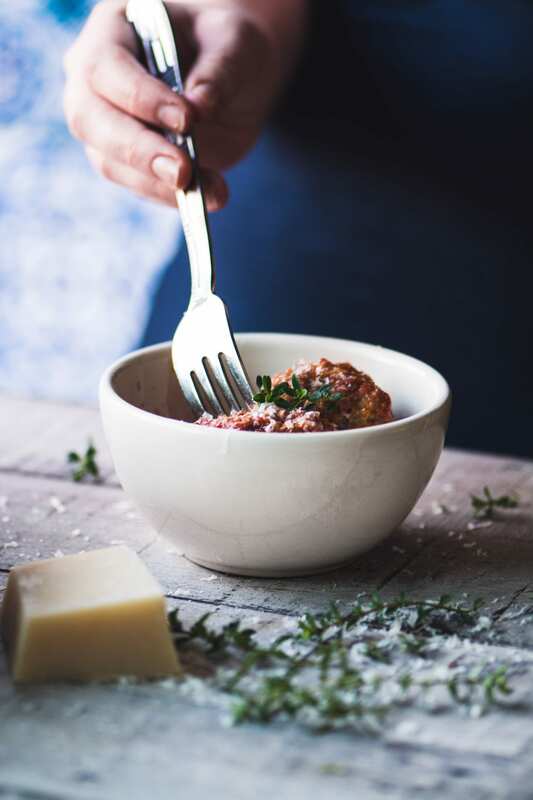 Even though it’s not strictly authentic, go ahead and serve these meatballs with spaghetti or over polenta if you’re craving more carbs. I love to slice the leftover meatballs in half, load up a split French roll with the meat and extra sauce, and then top with slices of mozzarella ~ a little time under the broiler and you’ve got the best leftovers you’ve ever had! Don’t forget to pin these famous Meatballs al forno! Now THESE are meatballs! 100% saving this recipe to come back to every time my Italian cravings hit. One of these days, Sue, I expect to see you show up as a DNA match on my heritage page…just about every dish you post, grabs my food core! I made the meatballs tonight….they were incredible! My husband said they were the best he’s ever had! Thanks for another great recipe! You made me laugh Candace, how fun to be foodie sisters! I can never, every resist a great meatball and tomato sauce, so I will be making these :) Beautiful! Oh I love this recipe. I love meatballs but never made them myself. I will have to use this recipe to make my own. I never ever grow tired of Italian food and meatballs are on the top of my favorites list. 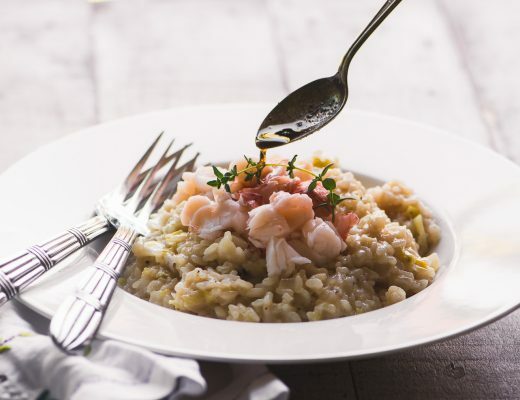 Nancy Silverton’s recipes are always winners and we are also big fans of La Brea products! Can’t wait to try these! Sue these totally sound amazing! I love meatballs and will definitely be trying these and probably a few of the others posted. Also I just sent you and email – it appears when I click on the link from MailerLite to view your post it comes up as a Mallicious site. This is the third time it’s happened but it’s fine when I type and go directly to your site. Thought you’d want to know. Thanks Vicki, I’ve got Mailerlite fixing that, it’s some sort of glitch, the site is fine, thanks for letting me know! That looks like a recipe that will give great meatballs. I would have to try with lamb and veal combo. Let us know if you make it with the veal Roxana! Those really do look like the best meatballs I’ve ever seen. It’s amazing how large they are and still look light. There is something with meatballs – is a treat! Your recipe is great Sue! If you allow me to make a slight addition…In remembrance to my grandmother -Ifigenie, the ultimate cook-: I add 1/4 cup ouzo in the mixture, pass the onion from the cheese grader which releases all juices, and mould the meat in-between my palms very gently -as if rolling eggs-! LOVE this Alexandra, I would never have thought of ouzo, what a wonderful flavor to add in. I wonder if it would make the mixture too wet? Might soak the bread in it rather than milk. SO nice of you! Sue, the mixture will still be OK, and keep the milk in, you need it. Have you ever tried condensed milk? Goodness – it’s amazing how every time I visit your blog, I leave craving another amazing dish. My mother used to make pretty great meatballs that sound similar to these. There is nothing better than a tender well spiced meatball and piled on a roll with cheese is heaven on earth! Thank you for reviving this wonderful post and recipe! Thanks Tricia, I enjoy reviving these old posts, I really had some great recipes when i first started up the blog, and it’s fun to bring them back to life. And meatballs on a roll with mozzarella is truly heaven on earth ~ amen! They look so juicy! my husband loves meatball, but not cheese…hopefully they would still taste as good as these without cheese.. I was directed to your site by thekitchn.com, the primary cooking blog I follow. I never leave comments anywhere, but thought I would here in case someone was dubious of these meatballs. I made these yesterday with a wonderful sauce and homemade chicken stock, cut the recipe in half since there are only two of us (leftovers are in the freezer for this weekend!). These were absolutely amazing, though slightly overcooked due to my negligence. I have tried for years to make good meatballs and always fail: they fall apart, they taste bland–the usual suspects. Now I understand the technique and also learned that stock really deepens the flavor of tomato sauce, and I will be adding this ingredient from now on. Thank you so much for your blog, which I will now patronize daily and look forward to reading your new posts. thanks so much Jennifer— I really appreciate your taking the time to leave a comment. It’s been a while since I’ve made these wonderful meatballs, but I remember them well…welcome to TVFGI! I’ve made these twice, once without the Cayenne and once with…they are without a doubt the best meatball. Everyone asked for the recipe. Also, I froze some and then cooked those…and yes…still the best meatball ever. Thanks anon! I have to agree, they are the best! That is just the tomato sauce in the recipe, Anon. Nancy calls for her own sauce, but I’ve substituted regular tomato sauce from a jar. What a good idea to refrigerate the meatballs before cooking them so they hold together better! Your photos are beautiful. Sound spicy with the addition of 3 tsp red pepper and 3 arbor chills! Great meat combination as well. It is spicy, Miranda, and I’ve toned that down in my 2017 update. 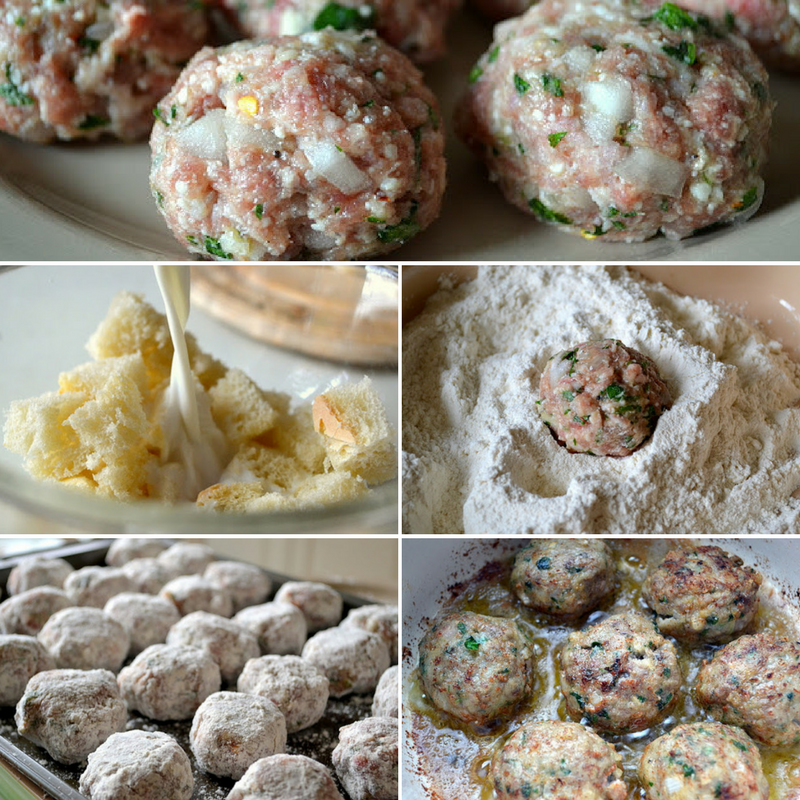 I love a good meatball and even though I have a great recipe from Rosa Mitchell’s book called “My Cousin Rosa” these are worth trying also. And hey some mistakes in ingredients only go to making the recipe original. They look great too! amazing!!! and..as always…such an inspiration! 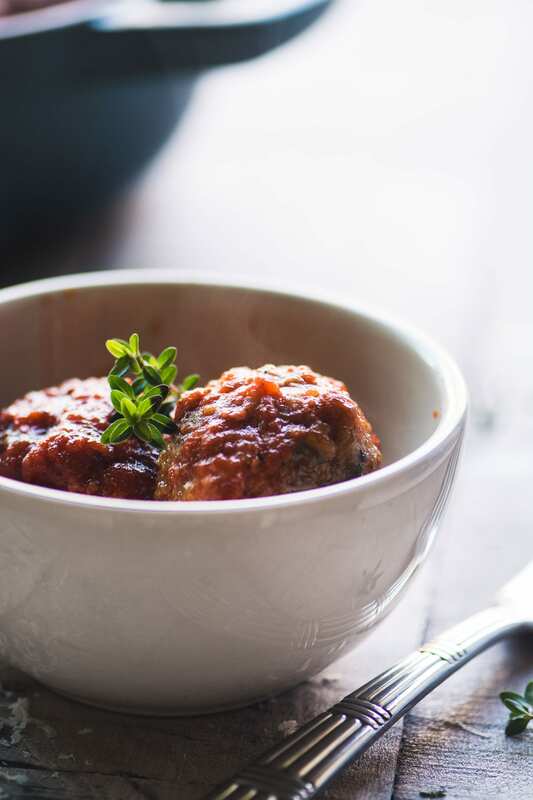 There’s nothing better than homemade meatballs and I love making them. 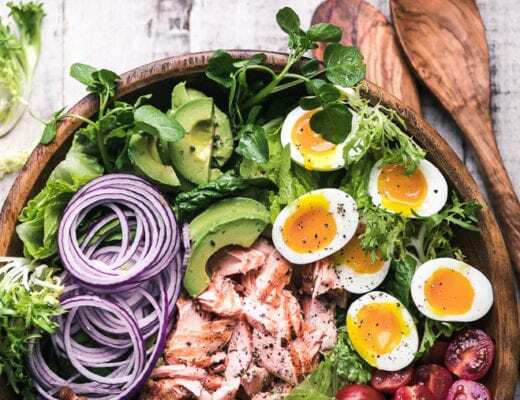 I’m going to give this recipe a try because it looks delicious! These look SO GOOD! Great post! Those meatballs look simply phenomenal. i love your combo of meat and flavors! Perfect with sauce, on a sandwich or just by themselves! Yum! I have to admit these sound like a whole lot more work than I’m usually interested in doing for dinner, but my mouth is watering to try them. Pork. Beef and Pancetta (or Prosciutto) sounds like a truly awesome combination. All of the flavors must have been amazing together! The good thing is that this recipe makes a lot of meatballs, plenty for the week, or to freeze for later meals. Now those are some meatballs – interesting that they came out light and airy. Those look, from beginning to end, A-Mazing! YUM. I’d have been there on grilled cheese nights, for sure! Love the combo of meats in the meatballs, Sue. This is an amazing recipe! I love the variety of recipes we chose this week. This is one of the most mouth-watering posts I have ever read! The photos, the description…what gorgeous meatballs! I love Osteria Mozza, one of my favorite restaurants. I did not know you lived in LA! I went to school down there, love that city, miss the weather. Interesting post! There is nothing like a good crusty loaf of bread! While on vacation, we had lunch at a grilled cheese bar. It was awesome! These meatballs are Incredible! I am bookmarking this recipe! Have a great weekend! Oh my gosh those look fabulous. I know they’d be an instant favourite with my husband as he loves meatballs and sauce. 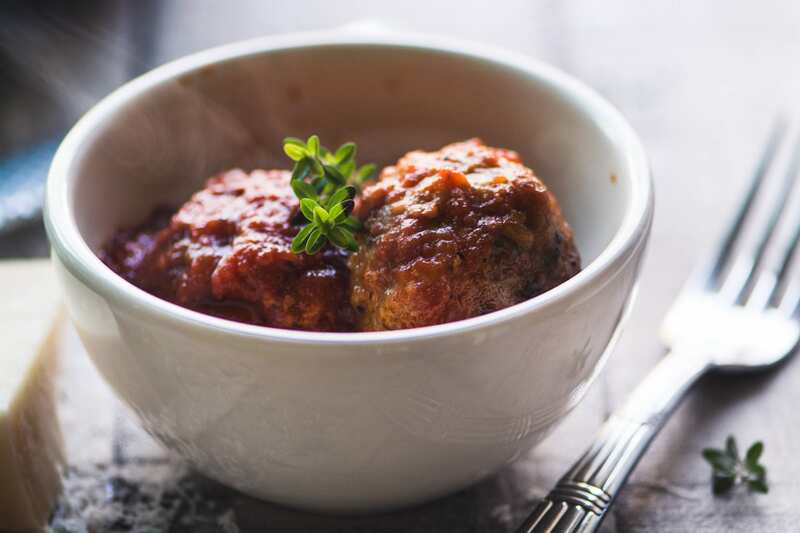 I have been looking for a new meatball recipe to be the star of the show and these fit the bill perfectly. Serve them with some artisan bread and you have captured our hearts and the essense of this great woman who deserves a spot on the list! These sound awesome…I love the meat combo! I know I would be a member of that cult following- I luvs me some grilled cheese! !